expressed his optimism to overcome the energy crisis by 2018 in view of result-oriented power projects. 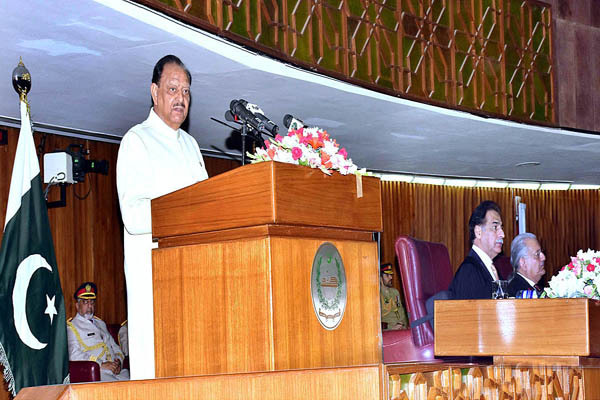 Addressing the joint session of the Parliament here Wednesday, the President said the government had taken bold economic decisions, including construction of the Economic Corridor, which also incorporated electricity projects. results and electricity generation had increased as improvement in the distribution system had provided relief to the people. energy crisis after completion of all the electricity projects,” the President said. construction of the Economic Corridor were the first steps towards that. He said when the Economic Corridor was completed, it would not only enhance regional connectivity but also help in developing infrastructure. main reasons behind the energy crisis. The LNG (liquefied natural gas) import from Qatar had, however, helped overcome the declining industrial production, which had saved public and private investment from sinking, besides providing employment to a large number of people, he added. He said there was a need to find alternative sources of energy including hydel, solar, wind and coal etc to fulfill the energy needs. Focus should be given on producing electricity from the water channels in Gilgit-Baltistan, Azad Kashmir and other upper areas because those sources could provide cheap and abundant power, he stressed. President said attention should be paid to smaller hydel projects as well. In this process, he said mid-level investors might be induced to participate in such cheap electricity projects and Gilgit Baltistan should be linked to the national grid. also a need for investment and improvement in the distribution system, he said.